1. Our task is to duplicate this card 100 times. 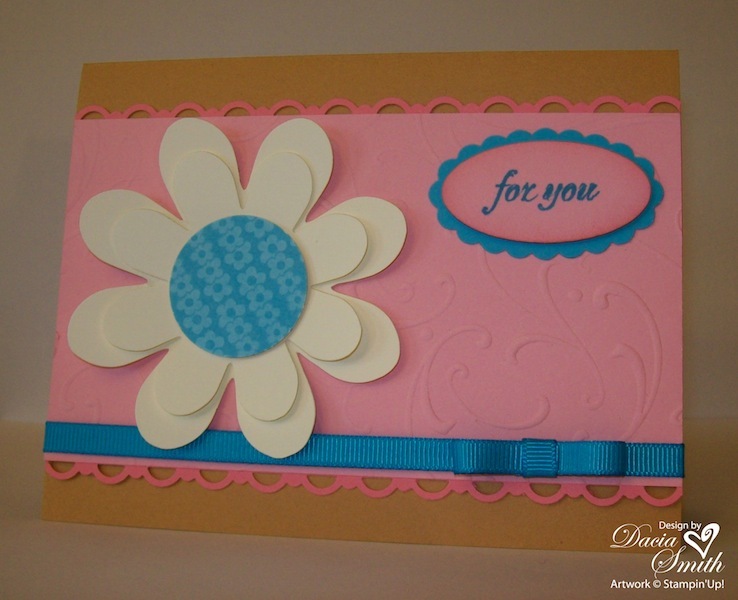 It’s a cinch with the help of a Big Shot Die Cutting Machine, the Perfect Details Impression Plate and the Flower Folds Bigz XL Die. 2. Don’t forget your punches. The 1 1/4″ Circle is a perfect fit for the smallest flower. You can dress up your panel with the right finishing touch using the Scallop Trim Border Punch. I just love all the coordinating products offered through Stampin’ Up! 3. No card is quite complete without a little added ribbon. To create the bow, form a circle using Tempting Turquoise Grosgrain Ribbon and seal with snail. 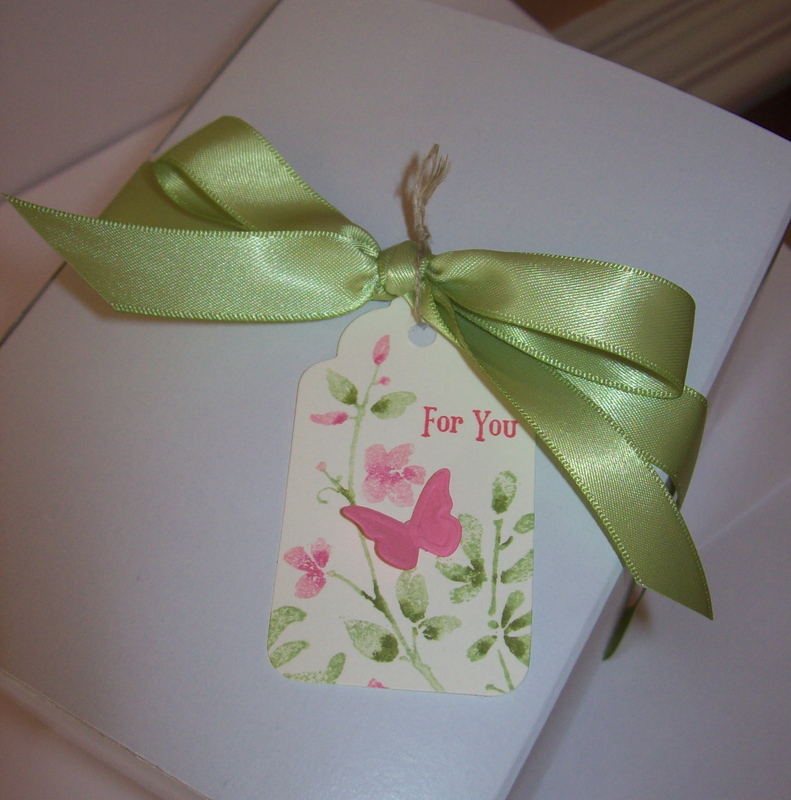 Bring center together, and wrap attaching bow to ribbon. Seal with Small Glue Dot. Adds a pretty finishing detail. 1. 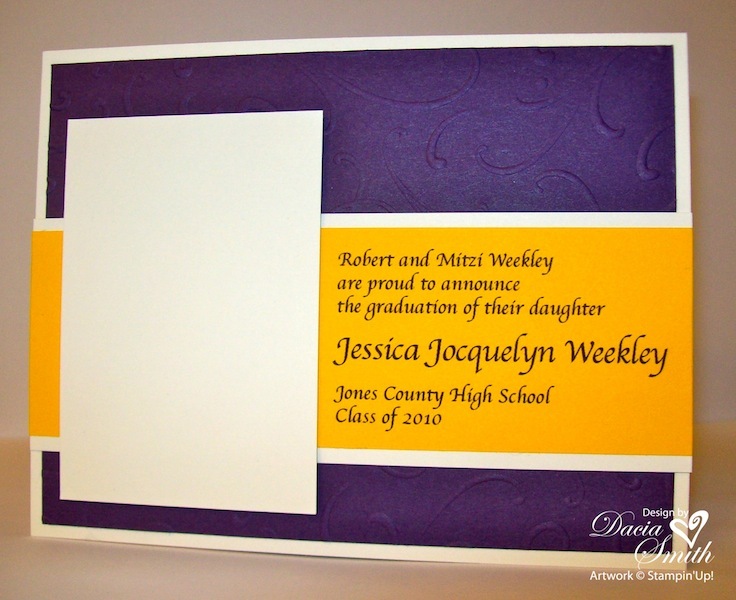 The alligator leather is created by covering the card stock with Versamark, and then sprinkling on a little Clear Embossing Powder. Using your Bone Folder, drag through the powder in random lines to create your pattern, and heat. 2. The rose clasp is made using Paper Vellum and the Scallop Circle Punch. The center is a Pretty in Pink Corduroy Brad. 3. Want a peek at the inside? The sentiment is from Kind and Caring Thoughts, and stamped in Basic Black. 1. The miniature shopping bag holds 4 notes and coordinating envelopes. The matching stamp is from Trendy Trees. What a great way to make use of all those little strips of card stock in your stash! You can find the directions for the miniature shopping bag at Scraps of Life. 2. This is a great way to make use of your retiring colors. The Barely Banana, Old Olive, and Taken with Teal is a smashing color combo. I’m also tucking my business card and stamp schedule for the summer inside. 3. 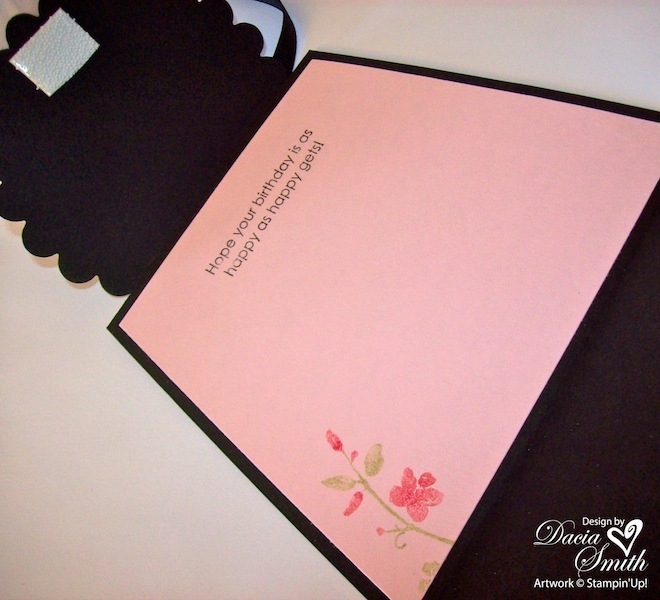 The sentiment is from Short and Sweet, and embossed in black. It is just the finishing touch this trendy little set-up needed. 1. This beauty combines fabric, ribbon, paper, and vellum. The variety of mediums add instant elegance to this project. The Paper Vellum is tinted with Baja Breeze and Kiwi Kiss. I dipped my Aqua Painter in ink and washed over the vellum. The leaves were hand cut, and the veins were added using a Bone Folder. The vellum curls slightly when moistened to create the natural look of a leaf. 2. The background is a piece of fabric leftover from my Big Shot Fabric Class. The color combination is Not Quite Navy, Cameo Coral, Baja Breeze, Kiwi Kiss and Very Vanilla. My inspiration for this one came straight from the fabric. The colors work together wonderfully. The base layer is wrapped in matching Very Vanilla Satin ribbon. 3. The sentiment is from Teeny Tiny Wishes. This set has a phrase for almost every occasion. 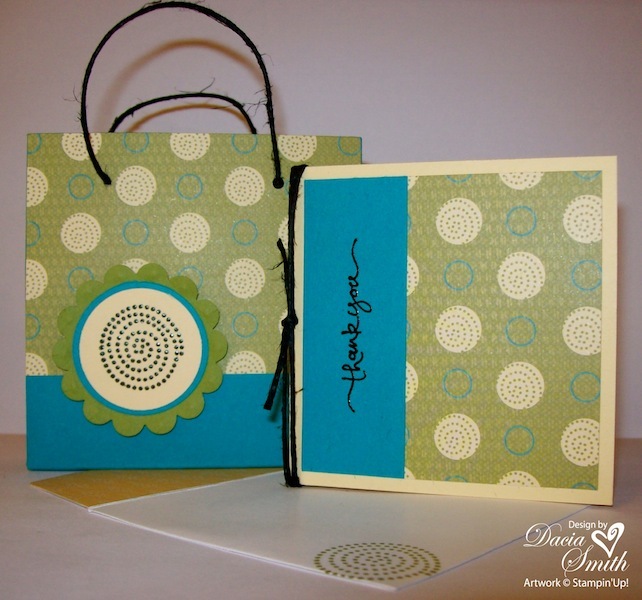 The small oval background is stamped in Baja Breeze using the flourish from Elements of Style. 1. When designing, provide a choice for your customer. The selection process often goes off without a hitch. These are the samples provided for a recent project. Can you guess which one was selected? 2. The school colors are Purple and Gold. The announcement just wouldn’t be complete without a fair representation of their colors. I’ll miss Summer Sun, it is one of my favorites when you need a bright warm color for a project or design element. 3. 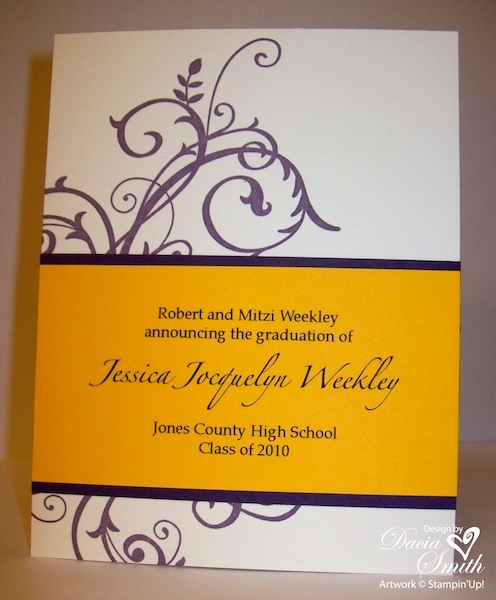 The first choice allows for a 2″ x 3″ color picture of the graduate. The text on each selection is printed using my computer. With the rgb formulas for each of the Stampin’ Up colors, matching becomes a breeze. 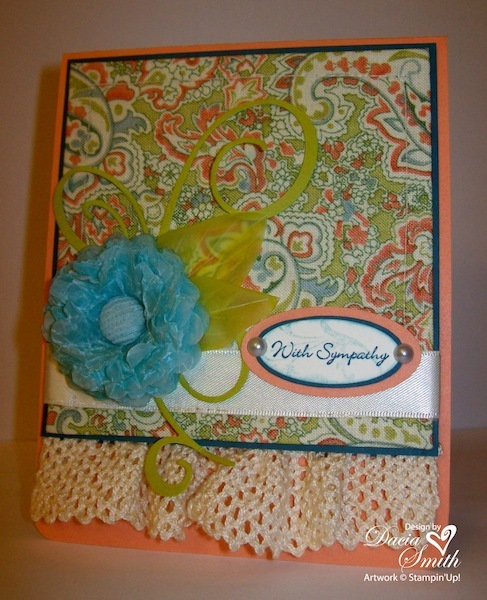 Color coordinating inks, paper, ribbon, and accessories drew me to the Stampin’ Up product line! 1. If you have some of your retired Occasions Mini items hanging around this idea might be helpful. 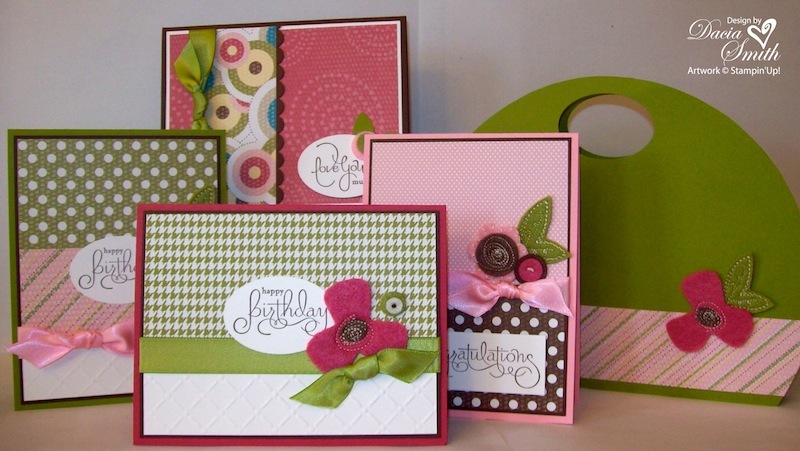 The set features the Sweet Pea Stitched Felt, the Designer Series Paper Stack, and the stamp set Well Scripted. I used it as a stamp class and the gals had a great time. 2. The purse holds all four cards and matching envelopes. The handle was created using the Wide Oval Punch. 3. My favorite accessory from the Occasions Mini was the Satin Ribbon. I was so excited to learn it carried over to the Summer Mini. I just had to buy all the colors. It is so yummy and the bows are just awesome! 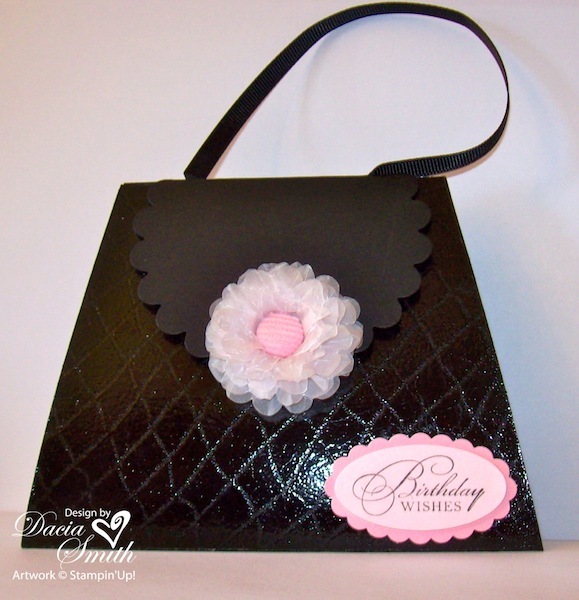 If interested in instructions for this purse and class please access the information thru the following link. This card is the prefect reflection of the person it honors. She loved flowers and her favorite color was pink. When she was laid to rest her casket was blanketed in a flower garden of numerous shades of pink sprinkled with life giving green. Sue Eades went to meet the Lord on May 7, 2010. 1. If the Subtles Collection is your favorite, the new Watercolor Trio stamp set from the Summer Mini catalog might be a must have for you. The images come to life when you color your stamps with Stampin’ Write Markers, spritz and go. 2. Details, details, details! Those little darlings just make a project. 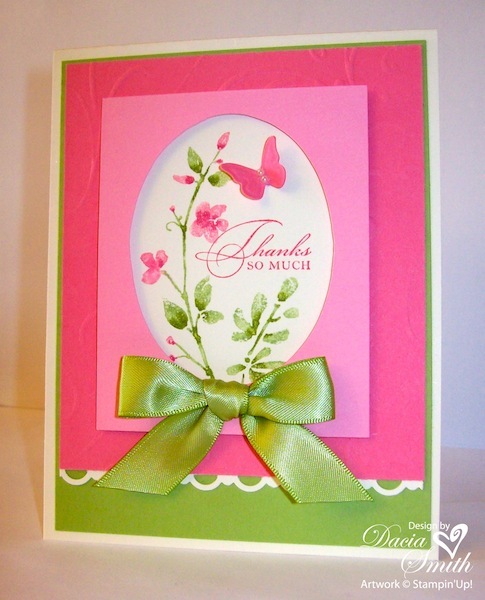 My favorites here are the soft subtle impressions on the background panel, the lovely lace scallop trim border, and the 3-d butterfly with a pearl body. 3. What project would be complete without a matching Certainly Celery Satin Ribbon bow? 4. My best friend’s mother passed away last week. Thirty thank you cards went out to the family. Want to see how they were packaged? This fun matching tag is just the bomb.